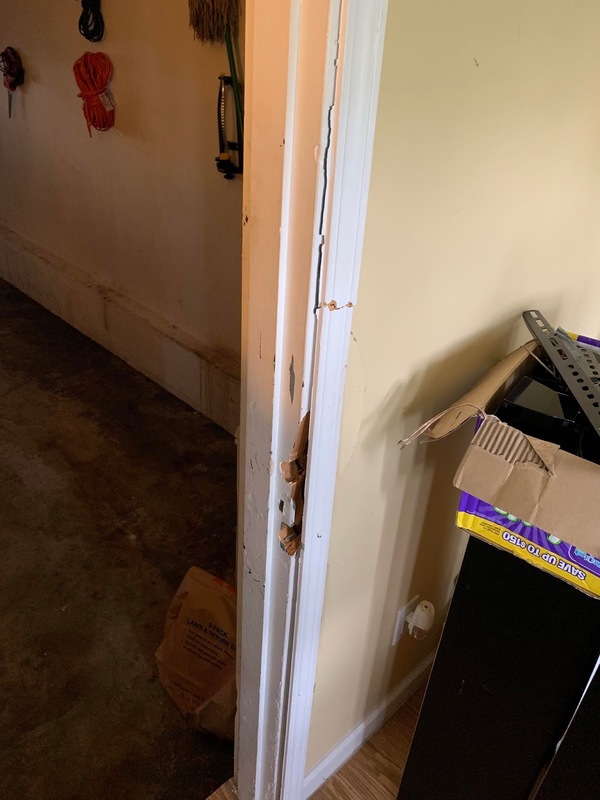 We just completed another repair project on behalf of a property management company, where the tenant had been the victim of a burglary attempt where the door was kicked in and the frame failed. We are not painters and advise our clients of such during the estimate phase. We are happy to perform the required repairs quickly and at the residents convenience. Below you can see the "before" images and understand what we were about to encounter. This view is from the Garage side of the door we were to repair. We advised the property manager that future painters would also be required to repair the walls and gaps around the exterior side of the frame. 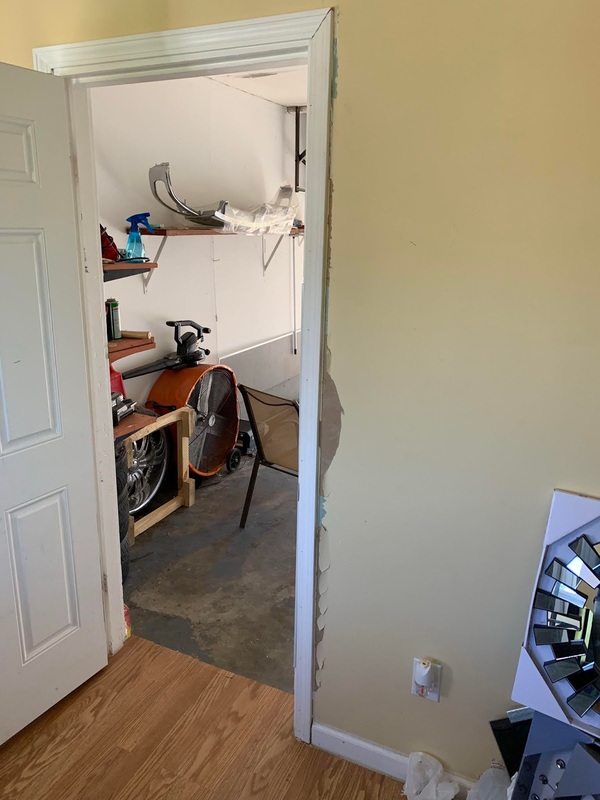 You can see the damage to the interior trim, the location where the strike for the entrance set and deadbolt has completely been broken out. Also the paint on the inside wall was torn away in the attack. Here is a better angle of the damaged door frame. This project type is one of our common project requests. Customers requiring to fix a broken door frame after suffering from door frame failure resulting from a kick-in attack. When considering to repair or replace the entire door and frame, understanding that the average cost in the local market to supply and install a new door and frame can be ~$1100 - $1500 for a quality professional to install a standard door and frame, it becomes worthwhile to seek alternative solutions that reduce cost while upgrading the security of the location. Enter the Strikemaster II. 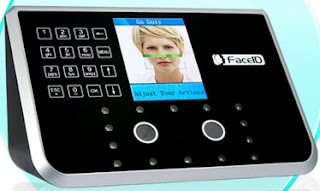 This phenomenal security and repair product is expertly designed and manufactured in the USA. A Safe Homes is a company based in the Carolinas that is on the forefront of product development, especially when it comes to safety, security and protection of the doors we all use daily. 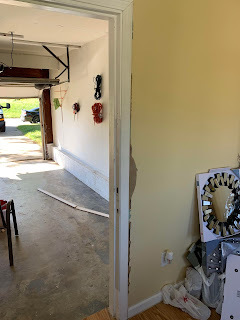 Comparing this to the before pictures shows the entire gaping hole left by the door kick-in (where the entrance set latch and deadbolt go), is now completely hidden. You can still see the area that requires painting, another project for another tradesperson for another time. This image shows a different angle of the new trim and the still damaged paintwork. This final image of the completed project shows a better view of the Strikemaster II. the unique patented product uses a 2 part process to create a "laminating" effect. Also the outer steel uses a lip designed to hook around the edge of the door frame. This lip is an integral part of the product design, because it increases the strength of the product when being attacked. Strikemaster II also uses stainless steel screws about 3" long, that tie the product, through the flimsy thin frame, to the stud behind, effectively anchoring the new product and providing almost impenetrable strength. Being 5' long and using 8-10 stainless steel screws, combined with the lip and the laminating effect, the product is very strong because a new attempt to kick-in the door will spread the weight applied by the kicking action across a wider surface. It is unfortunately, all too common that a great many homeowners, property managers, residents and tenants just are not proactive enough to anticipate future events like door frame failure, by installing products like this in advance of an event. Perhaps purchasing new designer shoes is of greater importance than providing security protection for your family and colleagues. Speaking to your local locksmith can provide you with some great knowledge and experience to effectively mitigate issues and events down the road. 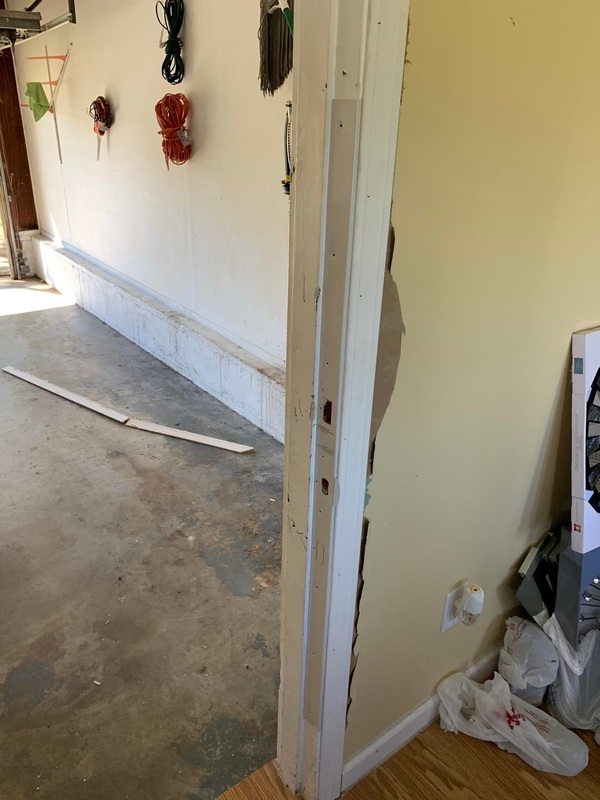 This entire repair project cost about $300.00 and they could maintain their existing door and frame. 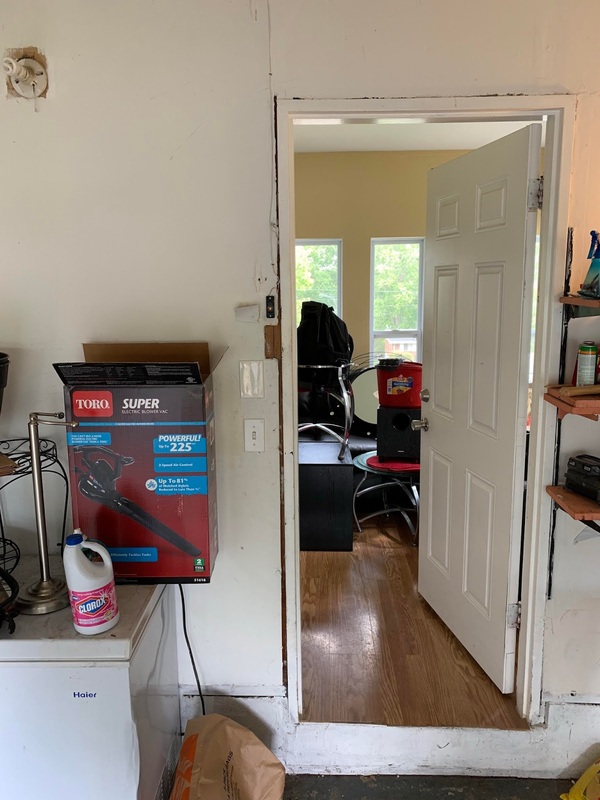 Compare that to the average door and frame replacement cost, that does not apply similar door frame strengthening to prevent another kick-in attempt and you effectively spent almost a thousand dollars more without increasing security and protecting your family and possessions satisfactorily. Often we find ourselves receiving calls from customers who request repairs to their entry doors on commercial premises. There are many and varying types, styles and functions of entry doors, used across the world. In the United States, many commercial entrances use aluminum shopfront entrances, often installed by professional shopfitters. Last week a client called us to repair a shopfront aluminum entrance door on their church entry. This door was probably about 40 years old, judging from the style, the lock, the fading etc. The initial repair was simply a readjustment of the door closer to enable correct closing distance. We explained to the client that the use of double cylinder locks on primary entrances is a violation of building codes/life safety codes. We recommended they contact their local AHJ (Authority Having Jurisdiction) to get in writing, permission to use an inside cylinder on their entry door, while explaining that potentially, their insurance could be void if someone was locked inside and unable to easily escape. Life safety codes trump security, especially on commercial dwellings. Here is an image of the outside of the front entry door. You can see where someone previous to me, decided to attempt to upgrade the security of the door, by installing a long metal plate along the door edge, to attempt to prevent a would be intruder from gaining access without damage. This image shows the strike removed from the door jamb. 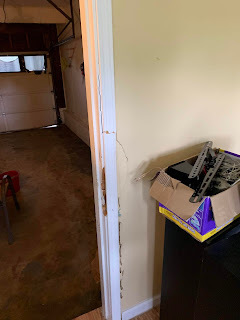 We thought of multiple ways to effect a simple repair to this issue, to reduce the gap between door and jamb, when closed. We settled on a repair using the fabulous Plast-Aid moulding repair product. We combined the Plast-Aid powder and ointment to a sufficient amount for the project, letting it cure to the point of a useable putty. We applied the putty to the door jamb, where the strike plate would normally fit and let it harden sufficiently to recreate the function that the strike plate would provide. The Plast-Aid product hardened in about 10 minutes and made the region of the door that the deadlatching pin was to hit, wider ensuring that the pin would then activate the security of the latch mechanism. The local AHJ had already been and required them to change the double cylinder into an inside turnbutton, while allowing them to continue using the paddle on the inside and not having to replace the whole fitting with a panic exit device. this image shows the latch mechanism fully seated in the strike hole (where the strike would normally have been fitted), contacting the deadlatching activator and securing the latch mechanism from loiding. This whole project enabled us to maintain using the custom made blocker plate installed by the previous technician but repair the deadlatching feature and provide stronger security, as intended by a dealatching lock system.